Gruene (pronounced “green” — and often mistakenly referred to as Greene Texas!) is a great weekend getaway destination and home to Texas' oldest dance hall. If you've never visited, you're missing out on one of the most adorable little towns in the Texas Hill Country. Here's a list of my favorite things to do in Gruene TX, plus lots of photos to inspire your next trip! 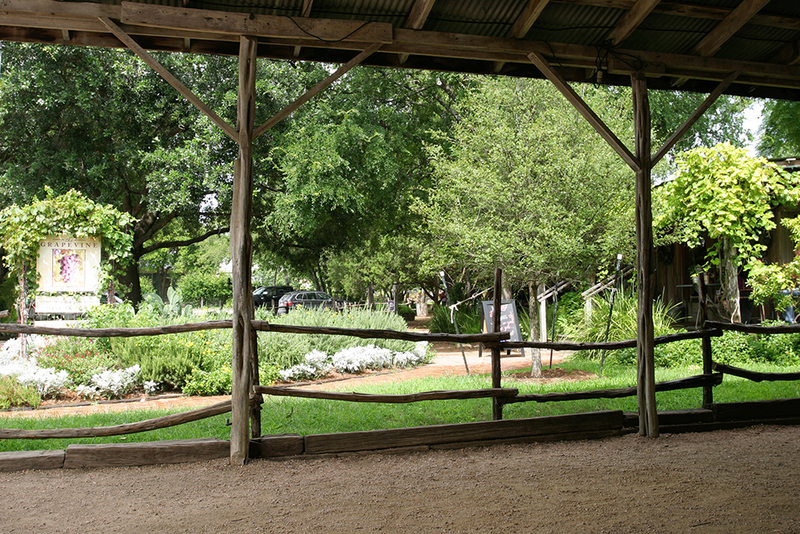 Gruene is the perfect day trip from Austin or San Antonio — at approximately 40 minutes from either city (varies with traffic). The actual historic downtown area in Gruene is only a couple blocks wide, so you can easily navigate the entire town in one day. Almost every restaurant or shop is located on one of two streets, so it's a very walkable town. TIP: Here is a link to a map. Parking is free and plentiful all over town! You'll want to turn off Hunter Street onto the little dead-end road next to the #2, because it's a huge parking lot that's rarely ever completely full. I absolutely adore Gruene Hall! Maybe it's because I'm drawn to almost anything with history and character, but it's long been a favorite spot of mine. Gruene Hall is Texas' oldest continually operating dance hall, and the building's age is apparent from the moment you enter the screen doors and step onto the slanted and rickety old wooden floors. On any given week you'll find live entertainment that ranges from hugely popular current stars to up-and-coming local Texas acts. Gruene Hall's website has a calendar of upcoming performers and info for purchasing tickets to shows or dance lessons. TIP: Gruene Hall is standing room only, but it's an open-air dance hall and you can listen to the music from the garden area outside if you aren't able to elbow your way indoors. Fellow reality TV show fans: Gruene Hall was featured in an episode of Kaitlyn Bristowe's season of The Bachelorette. See if you can find where she added initials and a heart to one of the posts. Gristmill River Restaurant & Bar is probably the most well-known restaurant in Gruene and for good reason; the food is scrumptious. It's located in a prime spot along the banks of the Guadalupe River and has a beautiful view, particularly in late fall or winter when the trees have dropped their leaves. Everything I've ever sampled off the menu at Gristmill has been delicious; it's one of those restaurants that gets my order right every single time. Without fail. I typically order their delicious old-fashioned burger with round cut Gristmill fries. (Obviously, all diets are off when visiting the ‘mill!) Sometimes I'll simply opt for a drink with a side dish, since their sides are very filling. I have a bad habit of snacking at the other shops in the area while I'm shopping, so it's nice to save room so I can sample goodies elsewhere. Click on each image to see it larger and for additional information. The Great Texas Pecan Candy Co. is my second favorite place to stop for food. It isn't a dine-in shop, but the sweet gentleman behind the counter is very generous when handing out samples. You have to try the Pecan Roca Toffee!! It's my top choice and one of my favorite items to give as a Christmas gift. Friends and family go nuts (ha!) for the stuff. The store also sells various flavored nuts, seasoned popcorn, pralines, brittle, and more. I'd suggest sampling to determine your favorites, then purchase the container that holds 3 varieties of your choice. 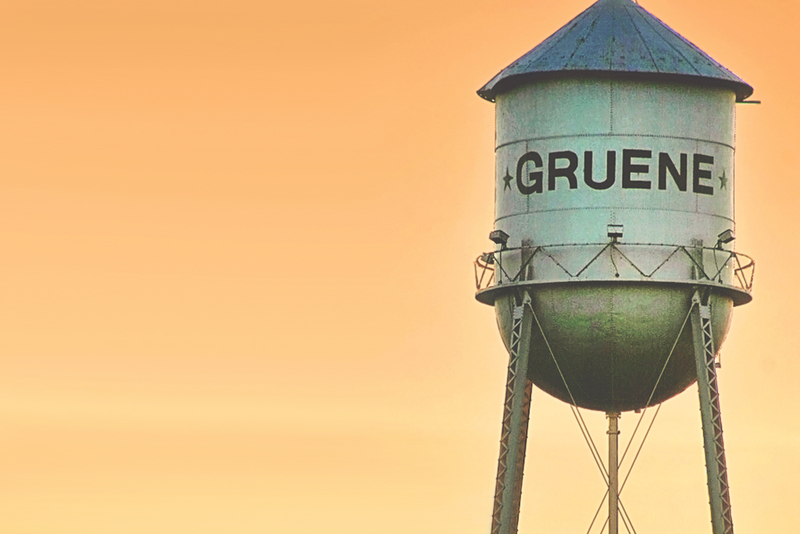 The landmark water tower in Gruene can be seen from miles away and has quite a history to it, including a depressed town manager who hung himself from the famous beacon and a dent in the cap of the tower that occurred during a land dispute. Although the tower once supplied water to the town of Gruene, it no longer serves that purpose and is now a decorative symbol of the city. 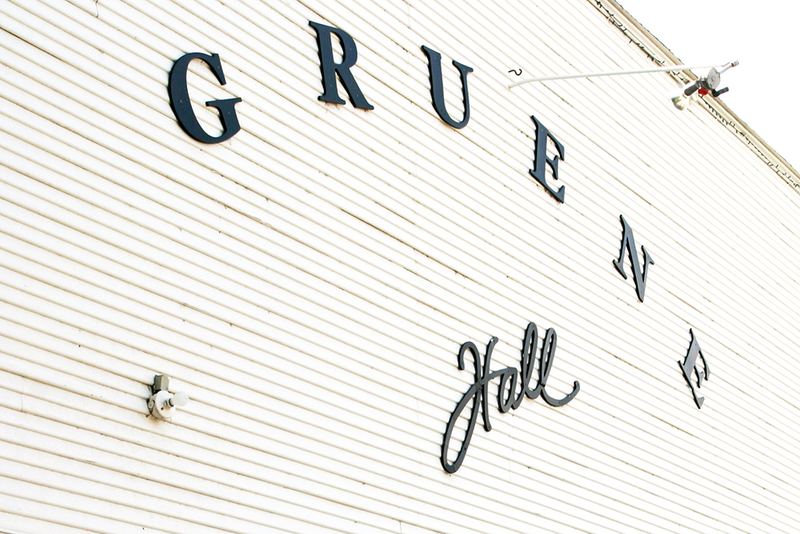 It is most commonly spotted in the background of Instagram shots featuring #gruenehall. Click on each image to see it larger and to view the source. The Grapevine is probably one of the first establishments you'll spot if you park in the main parking lot in Gruene. They frequently have live musical acts performing in the garden, and it's hard not to be drawn in to see what's happening. Simply put — it's all about the alcohol! There is a wine tasting room where you can sample a large selection of Texas wines that can be purchased by the glass, bottle, or case, and they also have beer on tap. It's a lovely place to just rest and chill for a bit. Gruene Music & Wine Festival occurs during the beautiful fall season and is one of Gruene's most popular annual events. The festival features the very best in live Texas music paired with wine and beer tasting events. It also offers numerous booths where you can sample delicious German foods. Old Gruene Market Days happens the first full 3rd weekend of each month (except January) and the event showcases local artisans who offer a wide variety of handcrafted items. Think hand-crafted leather, Texas photographs and artwork, jewelry, canned goods, children's clothing, spices/dips, etc. They operate under tents that are set up on the main street (Hunter St.) in front of Adobe Verde. Even though it's shaded, be aware that it gets very hot in the summertime! The Guadalupe River is stunningly beautiful and is a great place for taking pictures, playing in the water, or going tubing. The water is cold, but on a hot summer day in Texas it's just the ticket! Rockin' R River Rides and Gruene River Co. both offer water activities, such as tubing (a Texas tradition), rafting, and canoe trips. Daisy and I like to park in Historic Gruene and walk down Hunter Street until we hit the bridge, then kick off our shoes and go exploring. Even when visiting during the winter months, Daisy can't help but roll up her jeans and dip her toes in the crystal clear water! Tejas Traders is my favorite shop for home decor! They have a great selection of Hill Country-style decor items for the home. There's even more decor out back, so make sure you check out the entire store. Simply Detailed is an adorable store set in an historic older home, and it's where we spend the majority of our clothing budget in Gruene. The store is decorated beautifully and carries current trends in addition to basics, such as tanks and leggings. It's a boutique with a good selection of unique jewelry, in addition to the really cute clothes. This store reminds me a lot of the boutiques in Boerne and Fredericksburg. Pookie Janes is a fun shop for the ladies! Daisy and I both love their jewelry selection. We also purchase a lot of gifts in their shop. (They have great candles and signage.) If you're looking for cute and casual outfits, Pookie Janes is the spot. They also have a mancave! Gruene With Envy carries unique accessories, gifts, women's outfits, and shoes. Their jewelry is really colorful and the outfits are always fun and never boring. Gruene Lake Village is a short drive from the main street area. It's a new(ish) shopping village and is very picturesque. Although they still need to fill the majority of the shops, it's a great place for photo opps! 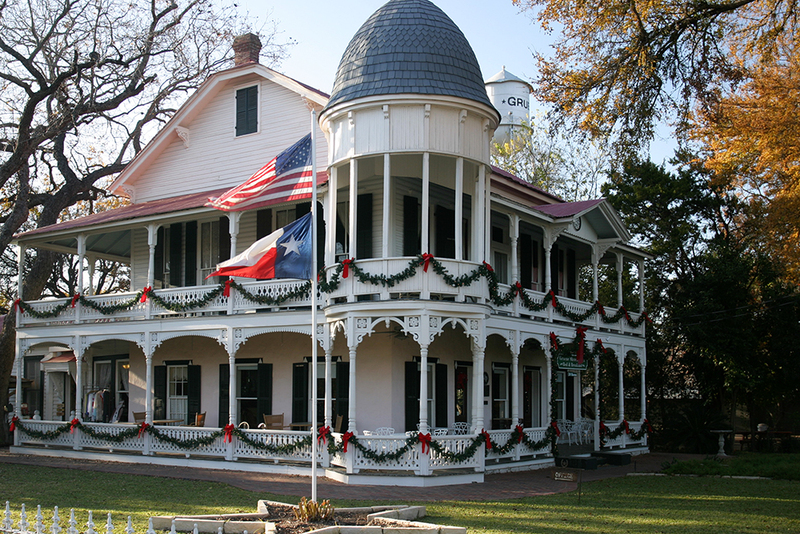 Gruene Mansion Inn is currently a 31-room bed & breakfast, but it once served as the town founder's home. In 1872, H.D. Gruene constructed this Victorian home as his place of residence along the Guadelupe. It's been featured in Texas Monthly and Southern Living magazines, and many of the rooms offer riverfront access. It's rated #1 on TripAdvisor! The historic Gruene Mansion Inn is centrally located and just steps away from Gruene Hall and The Gristmill Restaurant. Gruene Homestead Inn – If you prefer to stay on the outskirts of town, this is a good option. It's a collection of small farm homes located on an authentic German homestead. Select it if you love nature and want to relax on a rocking chair while enjoying beautiful Texas scenery. They have free wifi, a complimentary continental breakfast, and free parking. Antoinette's Cottage is a bed & breakfast with rooms dating back to the pre-Civil War era. There are many antiques and heirlooms on display throughout the home, and you'll find claw-foot tubs mixed with modern amenities. Look for the pink house with lots of flowers and butterflies by the front porch! Airbnb is my preferred option whenever I travel. If you prefer to rent a home in Gruene, please read my post How to Rent a Vacation Home You'll Absolutely Love where I provide all of my best tips for finding the perfect getaway! P.S. – You're welcome to use my $40 Airbnb credit on your first home rental! Gruene General Store is perfect for kids and the young-at-heart. It's ranked as one of the top 40 places to visit in Texas and is packed to the brim with food, toys, books, and unique Texas souvenirs. Daisy could spend hours in this store — most of it perched at the old-fashioned ice cream counter. She loves ordering scoops of Blue Bell Ice Cream in a cone, while I prefer sampling the fudge varieties. There's also a large section of flavored butter, salsas, and preserves available to taste. They have a Christmas tree on display year-round, so be sure to pick out an ornament to commemorate your visit! View of the ice cream and soda fountain area at the Gruene General Store. All the butter and salsa samples along the left side of the photo can be taste tested. My favorite is the Amaretto Pecan Honey Butter! DID YOU KNOW? Gruene was founded in the 1840's by German farmers and was once a booming commerce center. However, boll weevils and the Great Depression took their toll, and Gruene was essentially a ghost town by the 1950's. Chip Kaufman, a local student, was credited for saving the historic buildings from being razed. Holidays in Gruene is an annual event bursting with small town Texas charm. It's an ideal stop for families because there's something delightful for all ages. 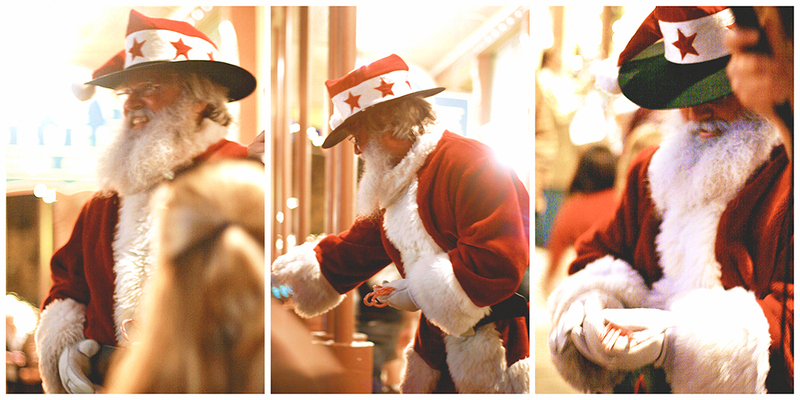 In Gruene, Santa is better known as “Cowboy Kringle” and he sports a cowboy hat, chaps and boots. During the annual town lighting ceremony, he rides down Hunter Street (on his horse, of course) and stops just shy of Gruene Hall. That's where he visits with the crowd and hands out candy canes. The most magical part of the evening is when he flips a special switch and the entire town alights with the twinkly glow of Christmas lights. Even the famous water tower receives a colorful treatment that can be seen from neighboring small towns! Cowboy Kris Kringle is an authentic Texas Santa! He wears chaps and has a bag full of candy canes that he passes out to to the kids. Check out my detailed guide to Gruene Texas during the holiday season. If you're seeking a unique travel destination, Gruene is one of my favorite small towns in Texas! It's a great vacation spot for the family, with a variety of activities for young and old alike. Please let me know in the comments if you have any questions. 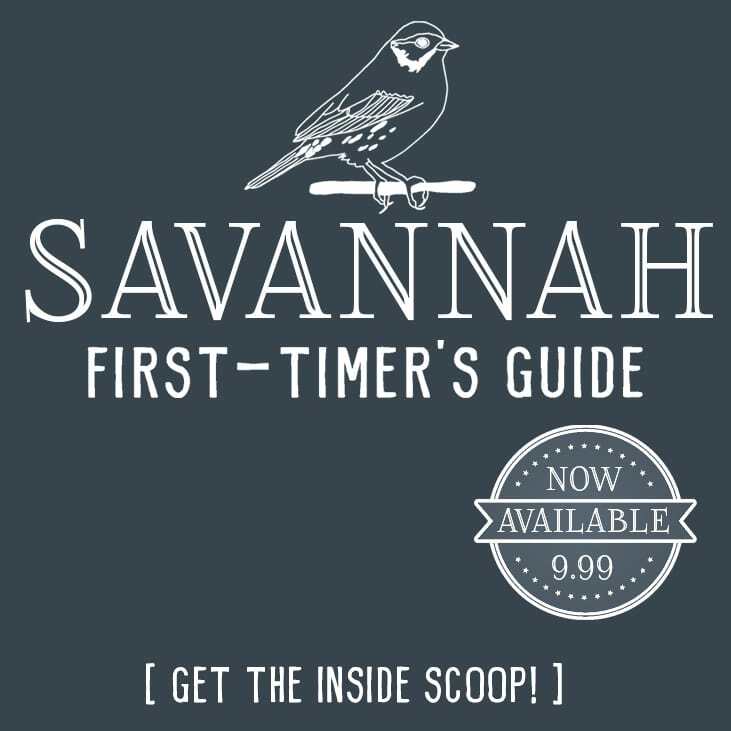 If you love reading about charming small towns, you may also want to check out my detailed guide to River Street in Savannah, GA. What's your favorite small town in the U.S.? What is the name of the place with he roosters? I was there last weekend and purchased a cross. I really need another one but wanted to see about them shipping it home. (Wisconsin) I can’t make out the wording on the side of the building. 😥 I absolutely LOVED visiting Gruene!!! Loved this post! I live in Dallas and I’ve never heard of Gruene! I really love all cute decorations around the holidays too! I’ll have to go! It’s not too far from Dallas. Definitely worth the trip! You could stop by Fredericksburg, too, if you like seeing cute little towns all lit up for the holidays. Great post! I just moved to Atlanta from Canada and I’m trying to visit as much of the South as possible so this is totally added to my list. Especially since I’m a huge Bachelor fan so you can find me at Gruene Hall. Hahaha! Oh yay, a fellow bachelor fan!! Watching that show inspires my travels half the time. They visit so many incredible destinations! I’ve never even heard of this place before and now I really want to go! I would love to stay in the Gruene Mansion Inn and eat at the Gristmill River Restaruant! They’re both pretty awesome. I’m craving a burger from Gristmill now that you’ve got me thinking about them! Thanks for this great post! Your daughter looked so familiar to me and it’s because I followed your memory keeping work years ago! 🙂 My parents are coming to visit me in May and I’m taking them to Gruene. I’ve lived in San Antonio for 3 years now, but have never been. Is the Grapevine okay to visit with children? Yes, that’s the same Daisy from the scrapbook magazines — except she’s practically an adult now. She graduates in 2 months! 🙂 I bet your parents will love Gruene. Mine do! Grapevine has a large semi-fenced outdoor seating area with picnic tables and I see kids running around that area all the time. The adults can sit at the table and enjoy wine and the kids can kick a ball around, play chase, or meet other kids. If you want them to sit at the table with you, I’d suggest buying them an ice cream cone from the general store next door and they can bring it to Grapevine. The kids would also probably love taking the short walk down to the river to stick their feet in. It’s cold, but the water is pretty calm and shallow (unless for some reason we get a huge rainstorm in the days before). Have fun! Great list! We are headed to Gruene today. Excited to visit this special little place. Thank you for the info!! Have a great time, Michele! I wrote this post about the historic section of Gruene (the main 2 blocks), but there’s a newer section that has some fantastic shopping that I also need to write about. It’s called Gruene Lake Village. If you get a chance, stop by there, too! Alibi Boutique has some really great (trendy/new) clothes and accessories. There are a total of about 15 shops in Gruene Lake, so it’s worth it to drive there from the historic section. You could walk, but it’s a bit of a long walk and in today’s heat, I’d suggest driving. 🙂 There’s a great little gelato/ice cream shop there, too–perfect for today!! Have fun!